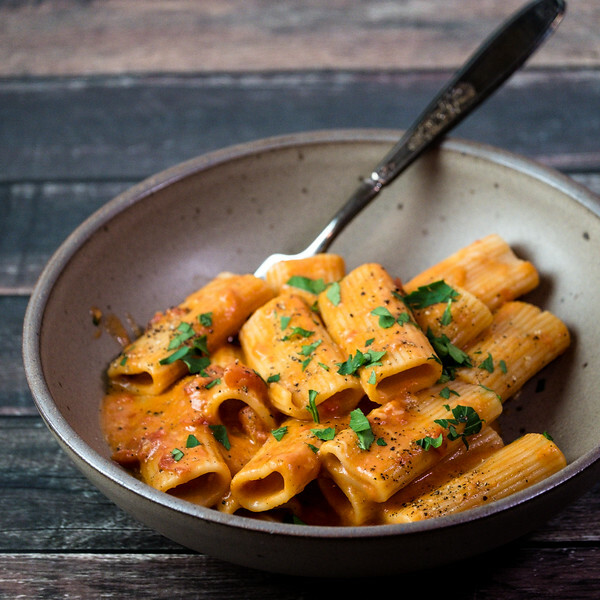 Rich and creamy, this Pasta all Vodka recipe is amazing!! 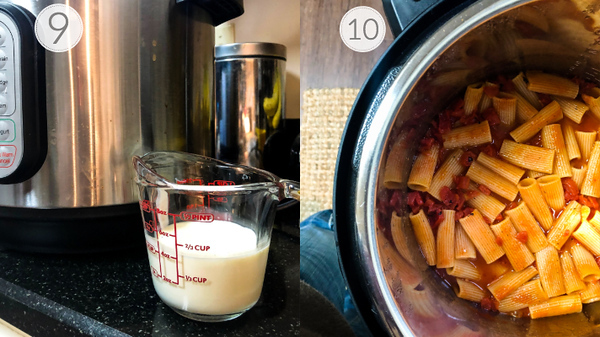 This easy Instant Pot pasta recipe is going to become a favorite, it’s so easy and so delicious! Butter, garlic, tomato paste, crushed tomatoes, vodka, rigatoni pasta, red chile flakes, heavy cream, Pecorino Romano cheese, and fresh basil. 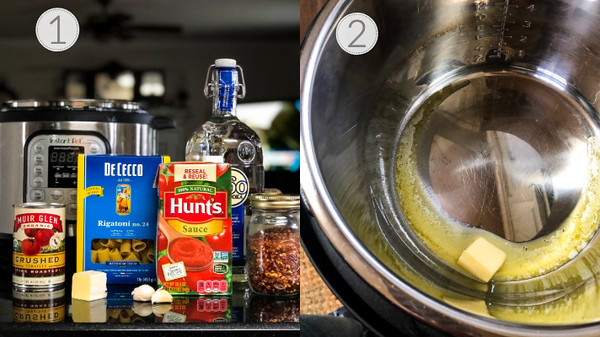 Click here to pin this Instant Pot Pasta all Vodka now! One of my favorite things about the Instant Pot is that you can cook the pasta right in the sauce! No need to heat up a big pot of boiling water! Not only does it save dishes, I think the pasta absorbs so much more of the flavor of the sauce. 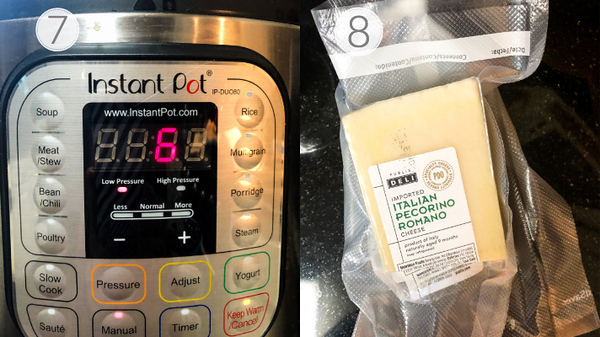 One of my most popular posts on this blog is this Instant Pot Ground Pork and Pasta – and once you make it, you’ll know why! It’s so good and so easy. Well, I have a feeling that this Instant Pot Pasta alla Vodka is going to also become a favorite. It’s so good. Like seriously good. You’ll want to make this for special occasions, except that it’s so easy, you’ll be able to treat yourself any day of the week. Unsalted butter – can use salted, but taste sauce before seasoning. Vodka – my Black Pepper Vodka would work great here! 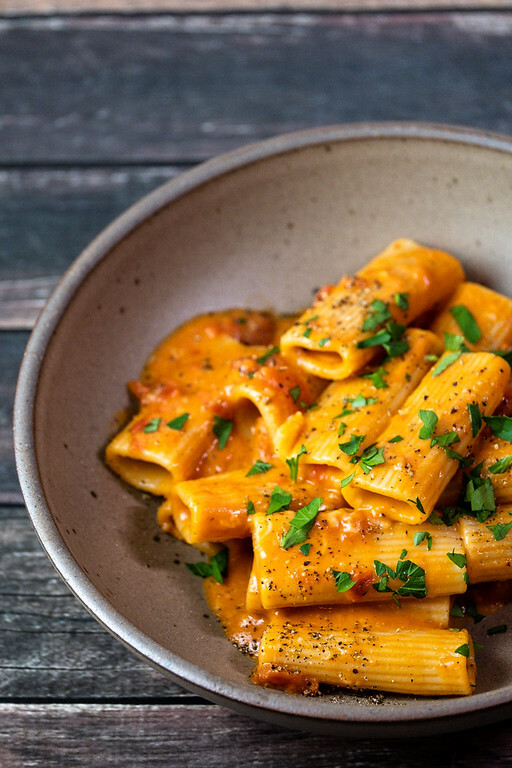 Rigatoni Pasta – can substitute penne. Heavy Cream – can use half and half if you are watching calories. Pecorino Romano Cheese – can use Parmesan. Fresh Basil – can substitute parsley, but it will be a different flavor. Step 2 – Turn the Instant Pot on and press the saute button. Add the butter. Step 3 – When the butter has melted add the garlic and saute. Step 4 – Add the tomato paste, and cook stirring for about one minute or until it begins to brown a bit. Step 5 – Add the tomatoes and vodka. Let boil for about a minute. Press the off button to turn off the saute. Step 6 – Add the pasta, red chile flakes, water, salt and fresh ground black pepper. Step 7 – Lock on the lid and set the steam valve to sealing. Set the Instant Pot to low pressure by pushing the manual button and then the pressure button – it will toggle back and forth between low and high. Select low, then use the plus and minus buttons to set the time to 6 minutes. Step 8 – While the pasta is cooking, grate the cheese. Step 9 – Measure a half cup of cream. Step 10 – When time is up, use a quick release to release the pressure by turning the steam valve from sealing. When the pressure valve drops, open the lid and give the contents and quick stir. Step 11 – add the cream. Stir to combine and let it sit for about 5 minutes for the sauce to thicken. This pasta was everything I hoped it would be! It was rich and creamy and heavenly delicious! 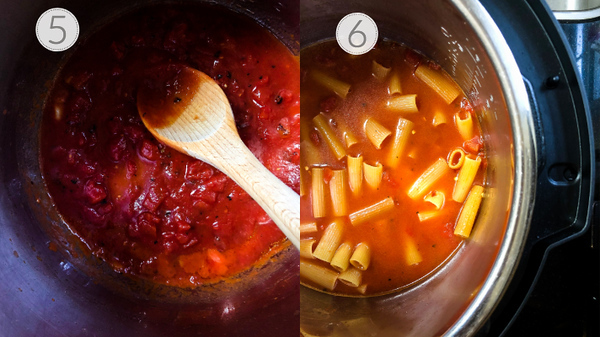 If you’ve read my post on my favorite Instant Pot Cookbooks, then you know I already love the Instant Pot Italian Cookbook by Ivy Manning, which is where I found this recipe. This rich and creamy pasta is so delicious! It's perfect for a special occasion, but easy enough for a weeknight dinner! Add the butter to the pressure cooker and press saute. 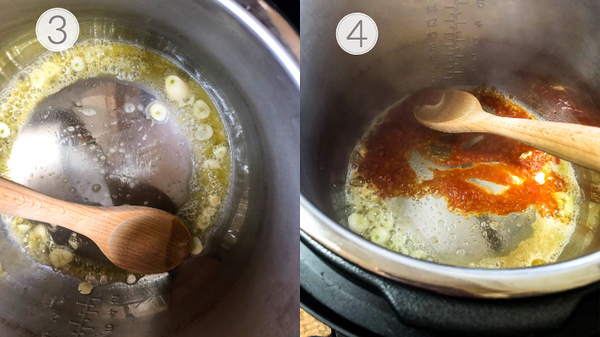 When the butter has melted, add the garlic and saute for about 30 seconds, then add the tomato paste and stir for about a minute, or until it begins to brown a little. Add the crushed tomatoes and the vodka and let it boil off some of the alcohol for about a minute. Add the rigatoni, red chile flakes, 2 1/2 cups cold water, 1 teaspoon salt and some fresh ground black pepper and give it a quick stir. Lock the lid in place, set the steam valve on "sealing." Press the manual button and then the pressure button to set the pot to Low pressure. Use the + and - buttons to set the time for 6 minutes. The pot will come up to pressure, cook for 6 minutes and then turn to keep warm. When the time is up, do a quick pressure release by carefully turning the steam valve to open. When the pressure valve drops, unlock the lid. Add the cream to the pasta and stir to combine. Let it sit for about 5 minutes for the sauce to thicken a bit. Then stir in the cheese and the basil. Add more salt and black pepper to taste. Unsalted butter - can use salted, but taste sauce before seasoning. Vodka - my Black Pepper Vodka would work great here! 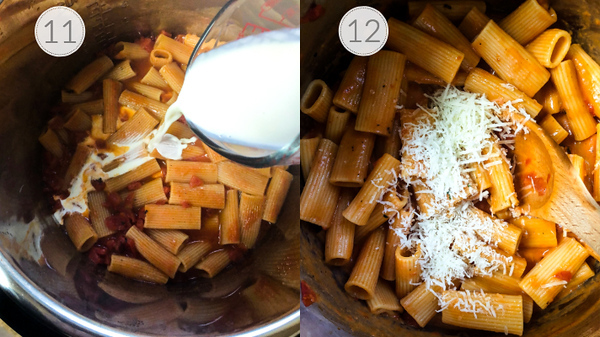 Rigatoni Pasta - can substitute penne. Heavy Cream - can use half and half if you are watching calories. Pecorino Romano Cheese - can use Parmesan. Fresh Basil - can substitute parsley, but it will be a different flavor. Note - this recipe cooks on LOW pressure. I sent your blog post over to my daughter. I gave her an instata pot for Christmas and I am sure she will love this dish…also, it’s good for her to have your blog address. Oh thank you so much! I hope she loves her Instant Pot as much as I do! I’m going to make this sometime this week! I may add some shrimp, but will cook them separately in a skillet. It would be great with shrimp! Okay, my curiosity is peaked. What difference does the vodka make? It’s a classic sauce. I think it adds some flavor and tenderizes the tomatoes. Mouth drop and salivating a little over here. Pasta is a staple in my home and this dish looks and sounds incredible. YES YES YES, Another delicious IP recipe for the win! Thanks for this recipe! It’s rapidly become one of my favorites! I love pasta and I love vodka. Never thought of combining the two though. It sounds good to me. I’m making this asap! It’s a classic sauce that I’ve always loved! Looks delicious – great that it’s all cooked in together. And love the sound of your pepper vodka. Making it in one pot is so easy. It’s always been one of mine too. So glad I can make it so easily at home!